Owen Brown is one of the ten villages in Columbia, Maryland, USA, incorporated in 1972. Neighborhoods in the village include Dasher Green, Elkhorn and Hopewell. Owen Brown lies south and east of the Town Center. The village contains the 37-acre (150,000 m2) Lake Elkhorn, with a walking path of two miles (3 km) and a picnic pavilion in the 23-acre (93,000 m2) park. Lake Elkhorn is named for the Elkhorn branch of the Little Patuxent River; Elk Horn Farms was also the name of the Dasher farm. Street names are taken from the works of Paul Laurence Dunbar. Dasher Green is named for the 670-acre Dasher family farm purchased in May 1963 by one of the Rouse company land acquisition entities. The farm was systematically reduced in size from 1971 to 1978, with the last parcel sold for development in 1996. Street names are taken from the works of John Greenleaf Whittier. Hopewell is named for the 200-acre land grant, Laswell's Hopewell, patented to Thomas Davis Sr. on December 6, 1728. The street names are taken from the works of Vachel Lindsay. In 1976, Ryland Homes announced it would start construction on homes priced between $50,000 and $70,000. The Village would contain 18 percent section 8 housing as part of its broad spectrum of housing options. In 1977, Howard County temporarily held construction of housing by Washington Homes for multiple code violations on over 25 homes. The Rouse Company was unable to procure the land around the Owen Brown Shopping Center, which remained independently operated outside of Rouse control with an anchor store leased by Giant Food. The Supreme Sports Club, an athletic facility, is located in the village. There are also tennis courts and a tennis "bubble". The East Columbia branch of the Howard County Library is located in the village. The village center contains a grocery store and other retail establishments. The Owen Brown Interfaith Center is located near the village center. Dasher Green and Hopewell each have an outdoor pool. ^ a b "About Owen Brown Community Association". Owen Brown Community Association. Retrieved May 28, 2014. ^ "About". Owen Brown Community Association. Retrieved March 19, 2018. ^ Joshua Olsen (2003). Better places, better lives: a biography of James Rouse. Urban Land Institute. ISBN 978-0-8742-0919-8. ^ Barbara Kellner (2005). Columbia. Arcadia. ISBN 978-0738517926. ^ Laura Barnhardt (May 19, 1996). "Farmers: town's forgotten pioneers; In 1960s, they sold land to Rouse, making Columbia possible". The Baltimore Sun. Retrieved June 20, 2014. ^ Joshua Dorsey Warfield. The founders of Anne Arundel and Howard Counties. p. 114. ^ Nicholas Dagen Bloom (2001). Suburban Alchemy: 1960s New Towns and the Transformation of the American Dream. Ohio State University Press. p. 176. ISBN 9780814208748. ^ "Columbia Suspension Lifted: On Washington Homes County Lifts Suspension On Washington Homes". The Washington Post. April 30, 1977. ^ Joseph R. Mitchell, David Stebenne (2007). 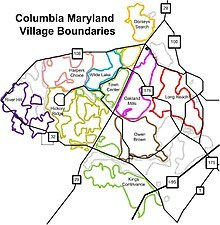 New City Upon a Hill: A History of Columbia, Maryland. The History Press. p. 114. ISBN 978-1-5962-9067-9. This page was last edited on 19 March 2018, at 05:20 (UTC).